I was speaking in a panel debate on governance at a well-attended Scottish Local Government Pension Scheme (LGPS) conference in Edinburgh today. The LGPS is facing some major changes to governance structures and pension funds are focused on what this means for the existing funds. The essence of my argument was that the LGPS is stuck in a pre-Maxwell time warp. For those not familiar with the history of pensions governance, Robert Maxwell committed a massive fraud by plundering his employees' pension funds in order to shore up his companies. As a result, pensions law changed to include better member representation on pension funds and a legal separation from the employer. This has been followed through in European law through the provisions of the IORP Directive. The LGPS is probably the last pension fund to operate with limited member representation and there is no separation from the administering authority. The pensions committee of Scotland's eleven funds are simply council sub-committees with councillors making the decisions. UNISON believes the current structures are unlawful, but they have to change anyway to comply with the UK Public Service Pensions Act. A consultation paper that sets out the issues will be published this week. Even more challenging for the current funds is the concept of scheme merger or at least shared services. UNISON has commissioned expert evidence that leads us to believe that larger funds perform better and reduce investment costs. Paying £millions to the same 'masters of the universe' who created the financial crash, is a particular concern to our members who are suffering the consequences with pay and job cuts. Interestingly, another presentation at the conference came to a similar conclusion on external fund management costs. In the current financial environment, paying too much to fund managers means even bigger cuts in services. The same applies to poor investment performance. In addition, we could use the £24bn of assets in the Scottish funds for useful local investment, rather than investing almost half of it abroad. Strengthening LGPS scheme governance is long overdue and members have a right to have a meaningful say in the decision making process. 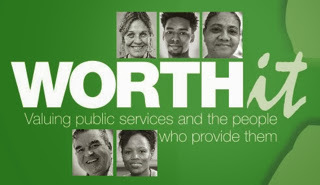 I am heading down to London today for the launch of UNISON's new 'Worth It' campaign. We all expect high quality public services but funding cuts mean that budgets are under pressure and staffing has been reduced. On top of that, UNISON members have suffered a real terms pay cut of between 8 and 17%. That damages the local economy as well as essential services. Long train journeys are a good opportunity to catch up with some reading and today that included the very relevant IFS analysis, 'Hard choices ahead for government cutting public sector employment and pay'. The Office for Budget Responsibility (OBR) forecast, based on the 2013 UK budget, that general government employment (that is employment by central and local government) would fall by 1 million between 2010–11 and 2017–18. However, following the Chancellor's latest cuts, they have increase the forecast to a cut of 1.1 million by 2018–19. In Scotland, public sector employment has been cut by around 58,000 since the financial crash and based on this forecast I calculate that we can expect to lose around a further 60,000 jobs by 2018. If this isn't bad enough, the IFS also noted the OBR forecast reductions to growth in public sector pay. Public sector pay is now forecast to be 3.6% lower in 2017–18 than expected in June, in part because earnings growth in the public sector has been weak so far this year, with no growth in pay in the 3rd quarter of 2013 compared with the same quarter a year before. This has led the OBR to reduce its forecast for public sector pay growth in 2013–14 to only 0.5% compared with a forecast of 2.2% in March. It has also reduced its forecast for each year up to 2016–17 compared to the March forecast. This is unlikely to be much different in Scotland because the Scottish Government generally follows the Treasury on pay policy, with the honourable exception of a more positive approach to the living wage. The IFS analysis also suggests an acceleration of the fall in public sector pay relative to private sector pay by about 8%. This is not driven by a change in the composition of the workforces as public sector workers are still more likely to be highly educated and in professional or similar roles. The IFS identify some important implications from this analysis. Primarily, that some public sector employers may well find it increasingly difficult to retain and recruit high quality workers. In Scotland, I would add that the ageing public sector workforce will exacerbate these pressures. A secondary point made by the IFS is that measures to mitigate recruitment problems might come at the cost of further job cuts if the budget targets remain at planned levels. For the UK and Scottish governments squeezing public sector pay has been viewed as a relatively easy way to cut departmental spending. Given the current OBR forecasts, the choices ahead now look rather harder. I don't normally blog on the legal side of my job, but I thought this Employment Tribunal decision would be of wider interest. Mr Olivier was a jobcentre worker and as a civil servant he was required to get written permission before taking up any political activity. He was sacked after he stood in council elections as a Labour Party candidate and for having a letter published in the local newspaper criticising the UK Government's tax policy. He claimed unfair dismissal and religion or belief discrimination based on his "democratic socialist" views as a long-standing Labour Party member. The tribunal therefore had to consider whether or not his belief in "democratic socialism" can amount to a "philosophical belief" under the Equality Act 2010. There was little dispute that he had a long standing history as a political activist. He had been an active member of the Labour Party for over 30 years and had stood and campaigned in many elections. He had also organised local campaigns against hospital closures and had featured in local newspapers as a result of his campaigning. Mr Olivier argued that the Labour Party is not just an organisation, but enshrines a core set of recognisable beliefs that he described as "democratic socialism". This is also a description used on Labour Party membership cards. He stressed that his strong belief in these values influences how he conducts his life. be worthy of respect in a democratic society, be not incompatible with human dignity and not conflict with the fundamental rights of others. Applying these tests to Mr Olivier's case, the tribunal felt that Mr Olivier has more than a passing interest in, and is more than a repeat voter for, the Labour Party. He has a strong interest in, and connection with, the history and moral tenets of the Labour Party. This affects how he lives his life. He has a philosophical belief in democratic socialism that goes beyond merely being a "political animal" who supports a particular political party. They therefore agreed that Mr Olivier's "democratic socialist" views could be a "philosophical belief" under the Equality Act 2010. In this case there was little evidence to suggest that he had been discriminated against because of his beliefs. The tribunal believed that the likely reason for dismissal was his failure to obtain permission from his employer before standing as a political candidate. None the less the legal point is an interesting one and could apply to members of other political parties who can show a level of belief similar to Mr Oliver. While on the subject of employment tribunals, it seems that claims have fallen sharply following the introduction of tribunal fees. Claims peaked in July at 7,307, plummeting to around 1,000 in September. So as UNISON and others predicted, the underlying trend revealed by these statistics is a massive collapse in the number of individual claimants. The judgment in the challenge to tribunal fees by UNISON is likely to be published this month. Access to justice in ConDem Britain is only available to those with the means to pay. One of economic theories John Swinney and George Osborne both agree on is the Laffer Curve. It is of course attractive to politicians because it suggests that tax cuts can actually increase government revenue. Sadly for both of them, some forty years after Laffer’s napkin scribbling, the evidence is limited - well actually non-existent. Sad person that I can be, my bedtime reading in my London hotel is the OBR's December 2013 'Economic and Fiscal Outlook'. What better place to look to see if the independent OBR thinks George Osborne's planned Corporation Tax cuts will increase revenue in real terms. "However, we still expect onshore corporation tax receipts to fall as a share of GDP from 2.2 per cent in 2013-14 to 2.1 per cent by the end of the forecast. This partly reflects further reductions in the main rate of corporation tax to 20 per cent by 2015-16." And here is a nice table that gives you all the figures. So while the Scottish Government's White Paper yet again churns out the merits of a Corporation Tax cut, we can see that even a true believer like George Osborne is struggling to deliver the same policy. No joy for the workers in today’s Autumn Statement, the very title is a joke given the weather. But then we don’t expect much joy from the shop steward for the super rich. The small scale fiscal measures play at the fringes of household expenditure and are paid for by other spending cuts – a further 0.2% from the Scottish budget. They do nothing to reverse the diversion of wealth from the bottom and middle to a super rich cabal and company profits. If the economy is now slowly growing, we will not forget that this has been the longest and deepest recession for generations, caused by the Chancellors austerity economics. The delayed proceeds of economic growth have to be shared equally and that means real wages, not tax cuts for the rich. 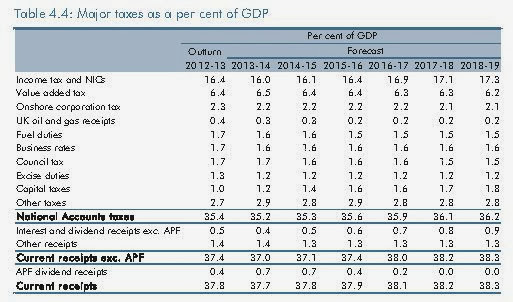 This highlights the Office for Budget Responsibility forecasts attached to the Statement. Households are now expected to spend more but earn less than was the case in March. Osborne once promised a ‘new economic model’ built on savings, exports and business investment. As the election draws near, he is returning to the ‘old model’ of consumption and household debt. UNISON members will be particularly concerned over the bringing forward of the state pension age. The state pension age is already rising to 66 by 2020 and 67 by 2028. It was then expected to go up to 68 between 2044 and 2046. Now that rise to 68 is going to come in earlier - in the mid-2030s - meaning that millions more people will retire later. This change also applies to public sector pension schemes in Scotland as the retirement age is now linked to the state pension age. This change is entirely cost driven and a particular concern in Scotland with our lower life expectancy. However, I wonder if the Chancellor has done all the calculations as savings in pensions will be offset by higher sick pay, benefits and the cost of early retirement pensions. It is also another unequal measure, as the affluent will still be able to afford to retire early, while the poor work on and die earlier. It could also add to youth unemployment as older workers block young workers getting jobs. 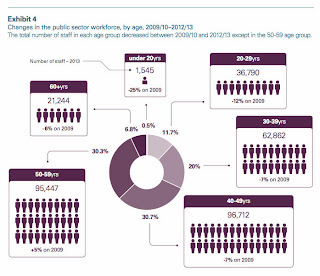 This was highlighted in the recent Audit Scotland report on Scotland’s public sector workforce that showed the only workforce age group that is increasing is 50-59yrs, up by 5%. Scotland will benefit from the Barnett consequentials of the additional funding in England for child care and free school meals. However, the £308m headline is not all recurring revenue spending. It will no doubt spark a debate in the Scottish Parliament over spending priorities. Improved child care now I wonder? £11bn of public spending in scotland could do so much more than the timid Procurement Reform Bill envisages. I was giving evidence today in the Scottish Parliament to the Infrastructure Committee on the Procurement Reform Bill. UNISON is supporting '10 Asks' from a broad based coalition of civil society organisations who believe we can get much greater community benefit from public procurement. My focus was on raising employment standards by making the Scottish Living Wage a requirement in contracts, so that we can spread the benefits into the private sector. In addition, contracts should end the forced use of zero or nominal hour contracts and strengthen training requirements. I used care procurement as my real world example because it's a national disgrace. Low wages have turned the sector into the new retail, with many staff leaving as soon as they can get another job. Continuity of care is being abandoned in a race to the bottom. The use of zero hour contracts is having a similar workplace impact to blacklisting. Staff are less likely to report safety issues or even care abuse, because they worry that they will not be offered work after raising inconvenient issues with their managers. Far too many staff are also sent out to deal with complex care needs after only a few days training at best. Our elderly friends and relatives deserve better than this. The Scottish Government has taken positive action to support the Scottish Living Wage, but they are hiding behind a misleading EU Commission letter on procurement. I set out in some detail why it is legal to make the living wage a contract performance clause with reference to counsel opinion. It is simply absurd to worry about a challenge under the Posted Workers Directive for low paid jobs. I suspect the Scottish Government is more concerned about the cost than tackling this issue. Other weaknesses in the Bill include only partial action on tax dodging. Firms who take the public pound should pay taxes like the rest of us. This means aggressive tax avoidance as well as tax evasion. If the Procurement Reform Bill is to be anything more than a largely irrelevant housekeeping exercise, these are some of the issues the Committee will need to address. You can view the full evidence session on BBC Scotland Democracy Live. There is no let up for the energy companies this week with Ofgem publishing their latest analysis of company profits, Labour launching a new plan and the Tories playing catch up. The Ofgem report is a useful resource and shows that the profits of the big six energy companies increased from £221m in 2009 to £1.19bn in 2012. In the current climate Ofgem also want to be seen to be tough on the companies, so the decision to send back network business plans has to be viewed in that light. I think the Labour plan is a definite move the right direction, but it still relies too heavily on fixing the broken market. What we need is a more radical plan that recognises the need for different ownership models, including public ownership, to break the dominance of the big energy companies. Today’s Audit Scotland report on the public sector workforce shows clearly how it’s the workforce that have taken the brunt of spending cuts. It shows that staff costs have been cut by over £1bn between 2009/10 and 2011/12. And that doesn’t include the savings from pay restraint. 26,600 whole time equivalent (WTE) posts were cut between March 2009 and March 2013 (7%). Some 9,665 were transferred to arms length bodies outside the public sector. 15,816 WTE left through early departure schemes, although these have been reducing in recent years. Councils made the biggest reduction (10%) while the NHS had the smallest cut (1%). The report, if anything, understates the picture because the numbers are converted into WTE. In terms of real people (headcount), 48,700 have gone (excluding the financial sector) since the height of public sector employment just before the financial crash - 5,500 people in the last year alone. Given the scale of early departure schemes it might be expected that the numbers of older staff would be reducing. However, the report shows that the only age group that is increasing is 50-59yrs, up by 5%. Probably due to recruitment freezes the numbers of younger workers are falling. The chart below illustrates this change. The report sets out the range of methods used by public bodies to reduce workforce costs with pay restrictions, vacancy management and early retirement the most common. More than a third of councils used compulsory redundancy. There is some criticism of the level of evaluation of early departure schemes. Future workforce changes are inevitable given the budget cuts to come. The report outlines a range of ways this might be achieved, including considering service delivery cuts. The report recommends better national and local workforce planning. Overall, the report is a useful description of what has happened to the public service workforce in Scotland. The recommendations are largely sensible, but little more than a sticking plaster over the impact of spending cuts to come. We are told this week that Mick Jagger is delighted with the prospect of becoming a great-grandfather, according to his granddaughter Assisi who is expecting her first child in April. I highlight this news story in contrast to the regular media stories that forecast doom and gloom over our ageing population. There is no doubt that demographic change will bring many policy challenges and I participated in a round table discussion hosted by The Herald on this very issue yesterday. However, the phrase 'demographic time bomb' ignores many of the benefits to individuals and communities. Older people remain significant economic contributors as well as important carers, of young and old, in their own right. Many of the voluntary organisations that make up the fabric of our society would collapse without the support of older people. There is also some recent academic work that argues that we may be exaggerating the impact on health services because we are likely to be healthier into old age. 60 is the new 50, as Mick Jagger might illustrate. There is also a lot a focus on nursing home costs, but this only applies to a tiny proportion of older people. Of course, none of this means that we shouldn't address the policy implications of an ageing population. The additional public spending impact is estimated at £2.5bn in Scotland by 2030. When I was working with the Christie Commission we were told that £1.5bn might be released from unplanned hospital admissions to help pay for this. With the increasing demand for beds that is now looking a remote prospect and I don't see any replacement plan in the current care integration proposals. One aspect we do need to focus on is the workforce that cares for older people. We are seeing a race to the bottom in terms of pay and training, with care being viewed as the new retail in job terms. I was discussing this with a group of home care staff recently. Most of the younger staff told me that they would leave as soon as they could get a better job - little prospect of the essential continuity of care that many older people need. Others described minimal training before being expected to address complex care needs. Even more worrying, those on zero or nominal hour contracts said they wouldn't flag up safety or abuse issues for fear of losing hours. Demographic change has positive implications for our society and we shouldn't over emphasise the negatives. What we should do is start serious planning. Respecting and developing the workforce is a good place to start. Today is the National Day of Action against Blacklisting. The practice of Blacklisting by construction and other employers has resulted in ordinary union members losing their livelihoods for standing up for their workmates basic rights, especially health and safety. "we wish to make it absolutely clear that we believe, on the evidence that we have seen so far, that the process of blacklisting by a secret and unaccountable process was and is morally indefensible and that those firms and individuals involved in operating the system should have known this." We know a lot about blacklisting in the construction industry because the information came to light as a result of an investigation by the Information Commissioner. The Scottish Affairs Committee report describes the actions of companies in detail. What we do not know is if this type of illegal activity is being undertaken today and in other industries involving UNISON members. The striking point about blacklisting is that it involves firms that are household names such as Balfour Beatty, Skanska and McAlpine. They are also firms that make £millions every year at the taxpayers expense, through public contracts. That's why the campaign has focused on tackling blacklisting through public procurement. Today, the Scottish Government has released new rules on procurement that we hope will address this issue. I was involved with other colleagues in drafting them and the Scottish Government deserves credit for taking serious action. this guidance applies to all public sector contracts regardless of value, although for lower value contracts pre-qualification procedures are unlikely to apply. The definition of blacklisting is wider than just the Blacklisting Regulations. It includes any discrimination against union members in recruitment, a scope that is more likely to encompass actions taken against UNISON members. The Procurement Reform (Scotland) Bill, currently progressing through the Scottish Parliament will be an opportunity to give these rules statutory force. However, the important point is that it sends out a very clear message to companies that if they get involved in blacklisting or other discrimination against union members, they will be excluded from government contracts. Another encouraging point is that parliamentarians at Westminster and Holyrood both contributed to this outcome. Now that is progress! Today’s Audit Scotland report finds that the Scottish Police Authority and Police Scotland face continuing challenges in delivering the savings required. In particular, their limited flexibility in managing police officer and staff numbers. That’s polite auditor criticism of the political police officer target imposed on Police Scotland. The report also confirms some key UNISON criticisms of the process leading up to the centralisation of Scotland’s police forces. In particular, that the savings estimates were based on an Outline Business Case that has never been updated or moved on to a Full Business Case. In addition, the report highlights the confusion over the roles of the SPA and Police Scotland - a confusion that was played out in public over many months. UNISON Scotland drew attention to the potential for conflict, given the lack of clarity, while the Bill progressed through Parliament. The report goes on to express concern that a number of governance issues still need to be progressed. This report articulates what everyone close to the process knows. This was a badly planned and rushed centralisation of a vital public service, with flawed legislation and a confused governance structure. The estimated savings were optimistic and more importantly, not worked up in sufficient detail. Add to all that political targets on police officer numbers that makes a nonsense of the statutory duty of Best Value. Huge challenges remain, but even at this stage it would help if the Scottish Government stopped its political interference and allowed Police Scotland to adopt a balanced workforce. The debate on constitutional change has been widely characterised as not living up to its historical importance. While parts of the debate have resembled, as Sir Tom Farmer put it, “a playground fight”, there are positive aspects of the debate that deserve credit. We are sometimes too quick in Scotland to condemn ourselves. Of course there are negatives. The recent TV debate was a playground fight and the Pavlovian response of some supporters on Twitter and in the comment sections of newspapers are shocking. Why some people think they will win over the undecided through slogans and abuse is beyond my understanding. And yes, anyone who has to deal with the Scottish Government understands that independence is the primary focus. It’s not that their eye is off the ball - that is the ball! The formal ‘Yes’ and ‘Better Together’ campaigns come in for a lot of stick; largely unfairly in my view. It’s their job to promote their case and rebut the other side - an essential base line for the debate. No one is seriously expecting objective analysis, so accept their role and treat the outputs accordingly. My main point is, that these negatives are masking some very positive debate and discussion in Scotland that probably wouldn’t have happened without the Referendum. I have done workshops and events across Scotland on the constitutional issue. It is certainly the case that these events have been dominated by questions about the consequences of independence. Anyone in the ‘Yes’ camp, who thinks that these matters can wait until the first election after independence, is living in cloud cuckoo land. Trade union members are rightly used to evaluating an offer and they will treat the White Paper and greater devolution proposals accordingly. However, the discussion doesn’t stop, or even start at independence or devolution. There is a real appetite to talk about the sort of Scotland they want to live in. It is not true that the debate is simply limited to shouting slogans. My own union UNISON has promoted its ‘Fairer Scotland’ paper, as has the STUC with the ‘Just Scotland’ initiative. Civil society organisations like SCDI, SCVO and many others have done the same. Some commentators argue that Civil Scotland has gone missing or is somehow irrelevant to a wider debate that the Internet has facilitated. Again, this is a gross simplification. This debate is different to the devolution campaigns because there is not a common position. But that doesn’t mean there isn’t a debate and Civil Scotland is playing its role in facilitating it. Just because these organisations don’t buy into a particular commentator’s view of the world, doesn’t mean that they are irrelevant. Of course social media is facilitating a wider debate, but it isn’t totally replacing traditional dialogue. If you look carefully at Twitter and blogs in the morning, they rely heavily on traditional media and good quality journalism. Twitter is great for a quick reaction and the blogosphere develops the analysis, but our media institutions are still the bedrock of debate. Then we have the heavyweight analysis provided by books. The Referendum has sparked a range of publications that provide high quality analysis and ideas. Just because the contributors have a preference for one side or the other; doesn’t devalue the analysis or the ideas for anyone other than the blinkered. Books like ‘Scotland’s Future’, edited by Andrew Goudie, and ‘Scotland’s Choices’ by McLean and Gallagher are good examples of the genre. Equally, I often turn to the late Stephen Maxwell’s ‘Arguments for Independence’ because, while committed to independence, he understood the need to examine and explain what it might mean in some detail. The Economic and Social Research Council has also funded excellent academic analysis. For those on the left, the referendum has forced us to think beyond the next piece of legislation or manifesto. ‘Time to Choose: Scotland’s Road to Socialism’, edited by Gregor Gall, was a good starting point and the Reid Foundation’s ‘Common Weal’, offers the prospect of new and different approaches. The Red Paper Collective has recently brought together the mainstream left in their publication ‘Class, Nation and Socialism: The Red Paper on Scotland 2014’. This is a book about the politics of social and economic change rather than simply constitutional change. There is plenty of vision and ideas, but laced with a pragmatic view of the possible, not the improbable. It also seeks to do what is often missing in the current national dialogue – putting the debate in a UK context. There are also those outwith Scotland who recognise the strength of our debate, as Owen Jones makes clear in his introduction to this book. Another, admittedly unscientific example, was a night out with some non-political pals. Without any prompting from me, they had a discussion about constitutional issues, including the currency, borders and the EU. I also noticed that three of the tables near me had at least short discussions on similar issues. Now, it may just be the pubs I drink in, but I think there is at least the start of a debate about the future of Scotland outwith the chatterati. Fuel poverty - better or worse in an Independent Scotland? Fuel poverty – better or worse in an independent Scotland? That was the question posed to a panel I participated in at the Energy Action Scotland annual conference today. I covered some of the issues in the energy chapter of the latest Red Book and I remain pretty sceptical that the independence on offer will make any difference. And by independence I mean the likely Scottish Government offer, not a wish list from others in the Yes camp who have no political road map for implementing their vision. Fuel poverty is an everyday reality for many people in Scotland with older people, those with disabilities or long term illnesses and those on low incomes, especially at risk. The consequences are misery, discomfort, ill health and debt. Around 900,000 households in Scotland – more than 1 in 3 – are estimated to be in fuel poverty, which means they are unable to afford adequate warmth in the home. The causes are a combination of poor energy efficiency of the dwelling, low disposable household income and the high price of domestic fuel. Energy efficiency is of course already largely devolved and measures have been introduced by successive administrations since 1999. We can argue about the scale and effectiveness of those measures, but the solutions are already in our own hands. Low disposable income is largely a reserved matter, as it is closely linked to the welfare system and broader economic policy. The shift from wages into profits since the Thatcher era is a major concern, not just for fuel poverty, but also because of the wider economic impact. The UK economy grew by £60bn over the past four years, yet household disposable income per person dropped by £500. That's why the cost of living and wages is a rising political issue. In theory independence could make a difference here, as I don't believe the Scottish Parliament would have countenanced many of the current welfare cuts and the Bedroom Tax in particular. However, I remain sceptical that the independence on offer indicates a radical shift in policy. Scottish Government support for the Scottish Living Wage is a positive indicator that they get the importance of increasing disposable income, although their reluctance to use procurement to extend the scope is a big negative. The broader case for a rebalancing of the economy doesn't feature much in SNP thinking and their economic polices remain firmly in the neo-liberal camp. The language on welfare reform is positive, but there is no indication that they are prepared to take any radical action on tax to pay for it. In fact quite the opposite. Their actions in government, such as the regressive Council Tax freeze and post-independence tax announcements indicate a low tax economy. You simply can't have Scandinavian levels of welfare and public services unless you are prepared to have a difficult conversation on tax with the people of Scotland. That leaves the issue of energy policy, vital because the price of energy is the biggest driver of fuel poverty. Now, I am a big critic of the UK Government's energy policy and supportive of many of the Scottish government's concerns, as in Fergus Ewing’s rant to the Energy Secretary this week, particularly transmission charges and decarbonisation targets. I therefore find the Scottish Government’s position on energy policy post-independence surprising, to put it mildly. Despite their criticisms they want to remain within the UK electricity market. This effectively means handing over the key levers of energy policy to another country, taking independence lite to new levels. There's nothing that says the UK has to use renewables to meet emissions targets – or, more importantly, Scottish renewables. There are alternatives, such as rigging the market to favour English nuclear stations – oh yes, they have just done that! The Scottish Government energy minister Fergus Ewing responds to this by pointing to the EU single market and cooperation models such as the Irish SEM. He also argues that UK ministers would end up accepting a continuation of the current single energy market across the UK after independence, on the grounds that, without Scottish energy feeding into the national grid, the “lights would go out” in England. This is a pretty bold claim with not much evidence to support it, given the Chancellor’s ‘dash for gas’ through fracking and England's access to the continent’s power supplies through interconnectors. Developments in interconnector access are another blow to Fergus Ewing’s argument. The Scotland-Norway interconnector is running into difficulty after SSE pulled out and the Norwegian state grid operator appears more interested in a link to England. National Grid’s submission to the Commons Energy and Climate Change Committee said England and Wales could meet their renewable and carbon emissions targets without any contribution from Scotland. I might be persuaded if the independence on offer was a planned energy policy that provides safe, secure and sustainable generation, which contributes to the economic future of Scotland and eliminates fuel poverty. This should include a more diverse generation ownership model and a bigger role for local government as we see in parts of continental Europe. Not to mention public ownership. Even a majority of Tory voters now favour renationalisation of energy companies. In Scotland, energy generation is dominated by big business and I don't see any willingness to tackle that issue. Fergus Ewing's rush to parrot the energy companies response to Ed Miliband's price freeze, indicates another status quo position. In conclusion, I accept that it is possible to pursue different energy, economic and welfare policies under independence that could seriously tackle fuel poverty. The primary requirement as ever is political will. However, the proximity of almost the only energy trading partner creates real challenges for those advocating independence and they will need to do much better than, ‘the lights will go out in England’ if they are going to convince me of the merits of their case. A balanced energy strategy that ensures security of supply, builds a more diverse industry and eliminates fuel poverty, would be a good start. The IFS briefing 'Taxing an Independent Scotland' has drawn predictable fire from elements of the Indy 'Yes' camp for highlighting some of the fiscal realities. However, it actually provides a much more important analysis of what you can do with fiscal powers, whatever the outcome of the referendum. They start by setting out what most objective analysts agree on. Scotland's onshore revenues are lower than in the UK as a whole, but that could be covered by oil revenues for at least a few years post independence. How long depends on whose oil revenue estimates you chose to believe. This still leaves the immediate fiscal problems that beset the UK as much as Scotland. The scary figure headline £2.5bn 'black hole' is explained as follows: "if the government of an independent Scotland felt the need to introduce tax rises or spending cuts equivalent to those pencilled in for the UK as a whole for 2016–17 and 2017–18, that would require £2.5 billion of new measures. If it also wanted to offset the decline in oil revenues by 2017–18 forecast by the OBR, that would require a further £3.4 billion, making £5.9 billion in total." Of more interest to me is the briefing's examination of the differences in taxation between Scotland and the rest of the UK. In particular, our more equal distribution of income and the higher take from income than property. Scottish onshore revenue comes less from taxes on wealth and property than the UK's as a whole (partly because council tax rates in Scotland are about 20% lower than in England), and more from VAT and taxes on alcohol and tobacco. At least our sins are good for tax revenue! I covered the IFS take on council tax reform in a post on the 'Public Works' blog yesterday. This would be even more important in an independent Scotland, because of the risk of cross border flows. The paper also highlights the risk of tax competition, not just Corporation Tax, but more widely, with a detailed impact assessment on each tax. I take from this analysis the risk that workers both sides of the border would be dragged into a race to the bottom. It doesn't look much like Scandinavia for Scotland or England. Another reason, as the Red Paper Collective has said, for the rest of the UK to take greater interest in the constitutional debate. There is more encouragement later in the paper for those arguing for independence or much greater fiscal autonomy. This is because current UK taxes may not be optimal for Scottish circumstances. Our more equal income distribution, less congested roads etc. The paper provides a wealth of data on yields that is enormously helpful when considering these issues. Their recommended solutions may not be to everyone's taste, including mine, but they concede that these are legitimate political choices. The important point here is that it enables a focus on what we do with powers, not just arguing over a list of them. As Anas Sarwar puts it in today's Herald, "No matter which side you are on, this is a change referendum, a choice between two very different visions of the future". However, the choices may be more nuanced than simply nationalist and Labour. Scottish Living Wage Week is an opportunity to focus on expanding the scope of the living wage across Scotland. Today has seen a welcome increase in the living wage rate to £7.65 (outside London). In comparison the adult minimum wage rate is £6.31 an hour. The Scottish Living Wage is good news for workers as they get higher wages that also improves health and job motivation. It’s good for employers because it reduces turnover, improves productivity and attracts better staff through reputational gain. The wider community benefits through lower benefit cost, less stress on the NHS and cash into the local economy. The Institute of Fiscal studies has calculated sub-living wage employers cost the taxpayer £6bn a year in in-work benefits alone. The indirect cost on poverty is around £25bn a year. A new report for UNISON by Landman Economics looks at the economic benefits and calculates that 58,000 additional jobs across the UK could be created by the stimulus impact of the living wage. This shows that the living wage is an economic win-win, strengthening the case for making it a statutory provision. Almost all the public sector in Scotland is now committed to paying the Scottish Living Wage with less than 3% of the workforce not covered. The challenge is to extend the scope to more parts of the voluntary and private sector. The Scottish Government has agreed to financially support a project to extend accreditation and this is very welcome. A field worker should be able to explain the benefits to a wider range of employers and help them achieve accreditation. However, the key next step is to promote the Scottish Living Wage outwith the public sector through procurement. The Procurement Reform Bill recently introduced into the Scottish Parliament should include a requirement that all contracting authorities stipulate payment of the Scottish Living Wage as a condition for performance of the contract. In addition, there should be a Code of Practice for the promotion of the Living Wage in procurement, giving guidance on the legal position, good practice, uprating, accreditation, s52 statutory guidance and the PPP protocol on the two tier workforce. The Scottish Living Wage Campaign and the STUC will be lobbying the Scottish Parliament on Thursday, November 7, calling for changes to public sector procurement. For those who argue that companies can’t afford the living wage, think again. Figures from the Office for National Statistics (ONS) show that the UK’s biggest companies increased their cash reserves by £83bn between 2007 and 2012. But some employers are refusing to use this cash to offer decent wage rises that would increase demand in the economy. Instead, workers are suffering the longest wage squeeze in over a century and in-work poverty continues to grow. Ed Miliband is even proposing tax breaks for companies that pay the living wage, opening up the prospect of making it even more affordable. Fair pay is by far the most effective way to tackle the cost of living crisis and make work pay. Scotland and the UK need a pay rise and extending the living wage is an important way to achieve it. 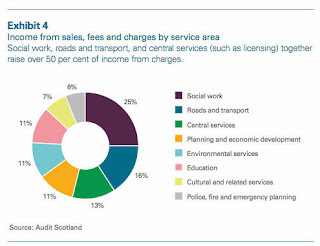 Audit Scotland has published a report on local government charges for services. 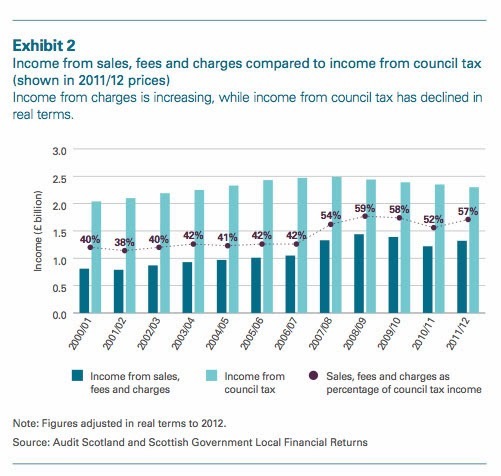 UNISON Scotland published its own work on the subject in May of this year, showing how charges appeared to be plugging the gap caused by the Council Tax freeze. Not a popular message at the time with the Scottish Government, as we debated the issue over the airwaves. But as always, we are first with the key facts! 50% of the amount they raise through council tax. And this doesn’t include rents or fines. The proportion of income from charges rose from 5.6% in 2003/04 to 7.4% in 2013. The implementation of the council tax freeze in 2007/08 altered the relative proportion of councils’ income from charges as the chart below demonstrates. Councils are facing continuing financial pressures through increasing costs and demands on services. The Scottish Government funding settlement to local authorities for 2013/14 is £9.9 billion, a decrease of about 2.25% in real terms. As a consequence there is an increasing need for councils to examine potential sources of income, including charging more for their services. Councils do not have complete freedom to charge for services. Many council services are provided with no direct charge to the service user like children’s education and street cleaning. Councils do however have discretion to charge for other services such as planning consents and building control certificates, the use of sports facilities, licensing and burials and cremations. Councils may also offer price concessions to certain service users based on, for example, their age, employment or financial circumstances. As locally elected bodies it can be expected that councils' charging policies will differ. The report recommends that councils should be transparent about their charges and set them in the context of wider service objectives. Councils should be aware of any unexplained inconsistencies and be able to explain why their charging policy differs from other authorities, including the use of benchmarking. As UNISON said in May, charges are cutting deep into people’s pocket and are often regressive. Freezing the Council Tax will not reduce poverty or inequality. Councils need resources to continue providing vital services rather than impose damaging cuts or punitive charges.